A website is only as good as the customers it drives to your business. The first step a customer takes to find your business online is to search for it by typing specific keywords into a search engine like Google or Bing. SEO is the process of optimizing your website, following specific guidelines, so your site will show-up first when a customer searches. Higher rankings means more targeted traffic. That converts into more customers and higher sales. Before strategizing any plan for optimization we start with an SEO Audit, a detailed SEO analysis and evaluation of your current website. This includes page content, keywords, backlinks, competitive analysis, target market and your overall online marketing presence. After the audit, we strategize the best SEO options for your business. Using advanced on and off-page techniques we follow a seven step process to customize an SEO Strategy that specifically helps your business rank high and be ahead of competitors. Understanding what keywords customers use most to search for your product or service online is the basis of SEO and targeting your niche market. Our specialized tools and strategies identifies which keywords are associated with your products and services as well as what keywords your main competitors rank highest for. By researching your top competitors' websites and SEO we get and understanding of what they are doing well and where your business can gain a competitive advantage. From the keywords they rank highest for to the design, structure and backlinks on their website we analyse it all to improve your search engine ranking over theirs. This is all about how search engines rank the quality and relevance of your website. We do an in depth study and analyses of everything on your website such as page titles, written content, images, site structure and meta data. Each individual web page is then optimized in order to rank higher and earn more traffic in search engines. Off Page SEO tells search engines how important your website is based on the external links to it. Studying your business, competitors and target market we identify and link your website to reputable and relevant websites valued by search engines. The more links to your website the higher your ranking. Having your website rank first when local customers search for your products is what Local SEO is all about. As a well established Vancouver Island SEO authority, our team has all the connections to localize your website with local content strategies and backlinks to local influencers. Website architecture and ensuring that search engines can effectively navigate your website and read its content is what we focus on with this SEO. All the websites we design and develop are specifically build on the basis of optimizing the structure of your website for effective search engine navigation. 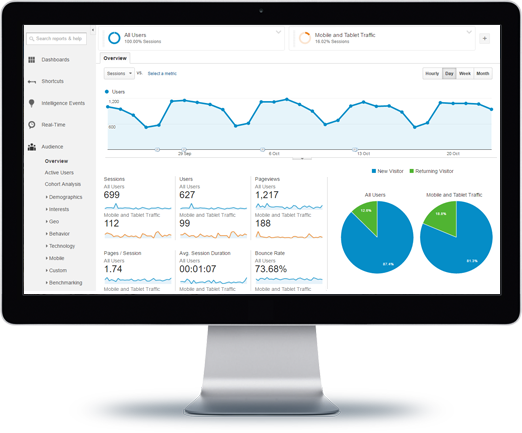 We use the most current analytics tools to monitor and evaluate your website's performance and ranking. Smart SEO is keeping up to date with your competitor's performance and the quality of your website's traffic. Using analytic data we keep refining your SEO campaigns to give you that competitive advantage of relevance online.